Use the foil cutter to take out the wine foil and prepare for the next opening. Some wine left? No worries use our high quality wine stopper; it will maintain the wines quality & taste. Next time you wane enjoy your wine it will taste just like the first glass after you just opened the bottle. We know the wine taste better when the temperature is 16-18 degree ,with a thermometer we can better know the time to drink or store. When we have found the screw is not enough sharp ,we can use them to replace the original corkscrew,it is so exciting. Perfect for all wine enthusiasts, the Corkscrew Wine Opener Wood Box Set offers effortless, self-pulling action and a strong, non-stick coated screw that will not damage corks. Don't hesitate,you can order now for your family or friends. NOTE: The wine on the picture is not included in the package, It is only used for product showing. 9 PCS WINE SET INCLUDES :a corkscrew wine opener, foil cutter, pourer, aerator，collar, stopper, thermometer and 2 extra screw. SIMPLE MECHANISM, EASY TO USE:It's classic straight-up performance mechanism ensures a quick opening of your favorite wines: Simply attach the wine opener to the bottle with one hand, and then pull the lever upwards and downwards - it's off with the cork in seconds. DURABLE MATERIALS: Made of heavy-duty zinc alloy with bronze-plated grips and handles, metal gears& a Teflon-coated spiral. 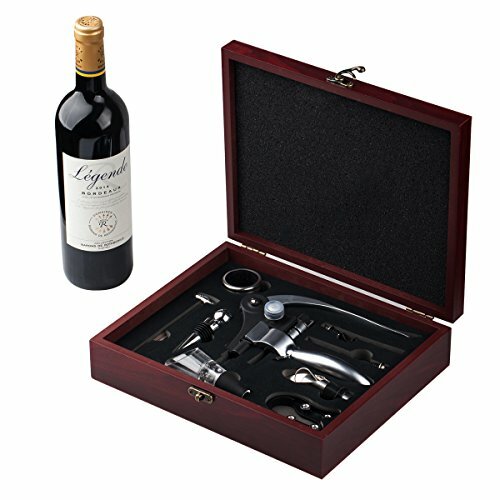 HIGH QUALITY WOODEN BOX:It makes this set a perfect gift for any wine lover. It is also a great gift idea for many events such as a wedding reception, housewarming, anniversary celebration, Christmas gift or garden party. APPLIED TO:The screwpull wine opener has durable soft grip handles and unique chrome plated finish.This wine set is applied to all corks typles both natural & synthetic corks ,any size bottle of wine or champagne. If you have any questions about this product by Cooko, contact us by completing and submitting the form below. If you are looking for a specif part number, please include it with your message.